The Adidas Adipower has an elongated shaft that features a bracing system formulated to keep you stable, a feature that's not often found on boxing shoes. With this added stability comes freedom of movement in the midsole and toe box, so you'll be able to shift your position quickly without potentially ending up with sore ankles. It's synthetic mesh and has great red color in the back on the Adidas famous logo. Use this shoe for ring practice or professional events, you will be satisfied with its quality for a long time. The Asics Cael V7.0 advertises as a men's shoe but is in fact unisex. If you're a woman that's interested in this footwear, just remember to go down at least two-foot sizes before in relation the men's size. It has an outstanding lacing pattern which allows the wearer to quickly put them on. The tread, while thin, is very flexible and won't impede any fast movements when you need to move hurriedly. 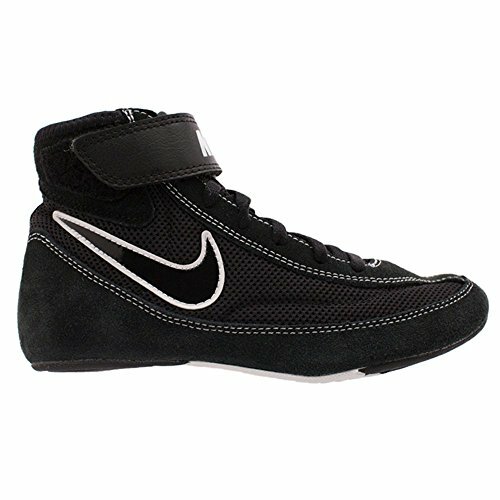 Feel free to use this shoe on or off the ring; it's highly recommended for anything that has settled on choosing only one boxing shoe and nothing else. Everlast PIVT is a low top boxing shoe with black and gold patterns. The material is mesh, so you'll get plenty of room for your feet to break when your boxing. There's also a small space for a tread which provides moderate stability on a canvas floor. Looking at the toe box, you can change with better confidence since the tips are placed in an angle that's perfect for getting you positioned into a quick and straightforward trajectory. Recommended for people that like tread in their boxing shoes. The Nike Speedsweep is another low top shoe that has a very thin outer some in the place of tread. But while it may lack tread, gains in foot motion. When on the canvas, your feet will feel as if you're not wearing shoes at all (in a good way). As a result, movement speed is unlimited, whereby you can avoid punches and charges from your opponent without exerting too much energy in the process. The Reebok Boxing Boot is a midsole product that's also good for in-ring or training practice. Still, you may find yourself using it more for ringside sessions than anything else. 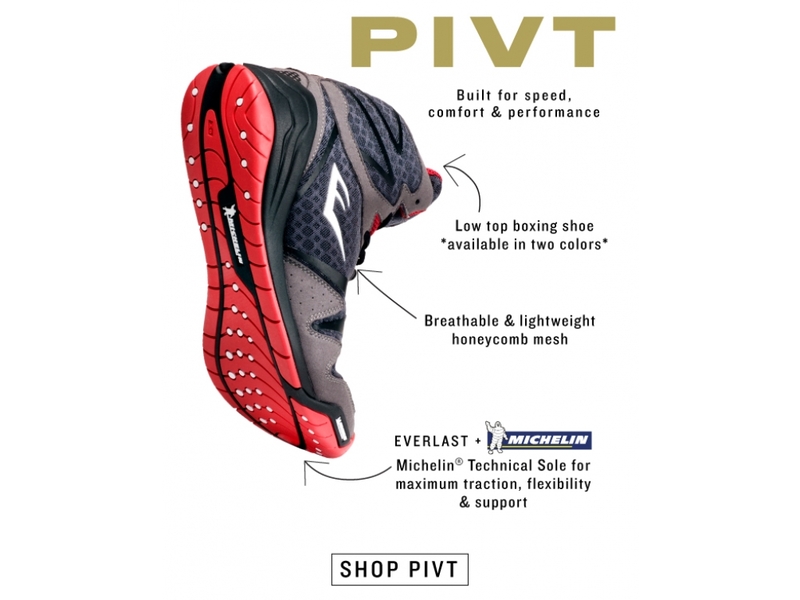 It's a good sparring shoe that's built to last long on hard surfaces without eroding too fast. Liftoff is also superb, and practice techniques such as jump rope will be much easier to do with its moderate ankle bracing system. Although it won't break too fast, you may find cuts and bumps on the surface after the first week of use. If you want boxing shoes that appear too dirty early in their lifetime, then you may want to look at some of the others on the list. The Rival low tops are sold in several unique colors but all maintain the same level of breathability as any other shoe on the list. They're also unisex, so will look good on either men or women. They're also pretty wide, so those with flat or widened feet will feel right at home in its comfortable interior. They're so relaxed, you may jump find yourself wearing them outside of the gym! 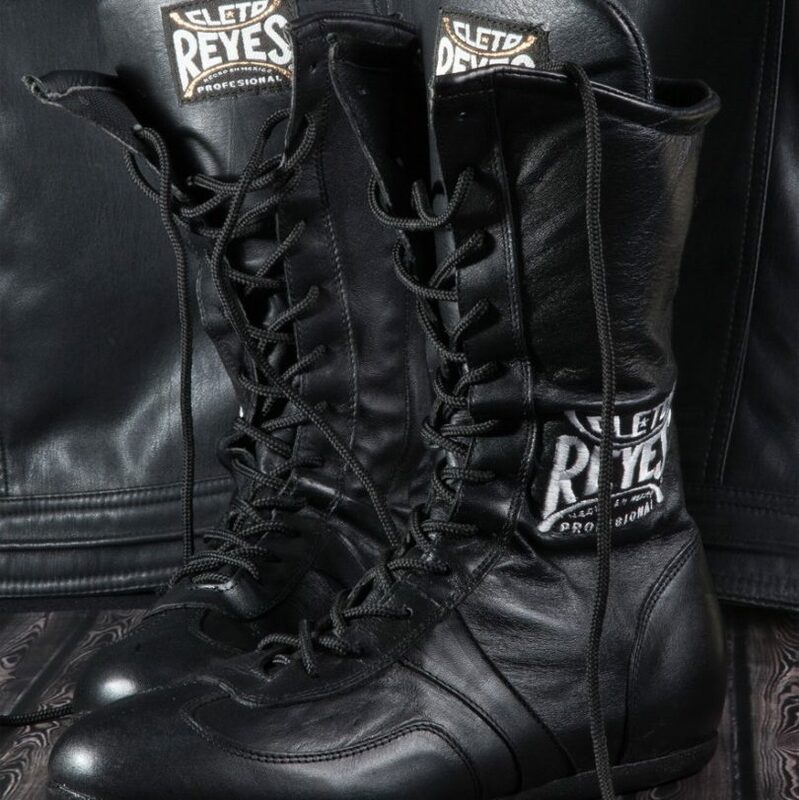 Cleto Reyes is known for their high-quality boxing shoes but has ventured into the realm of boxing footwear. These are solid and extremely sturdy for ringside and ring sessions, so whichever you have planned, the pair should perform as expected. However, if you have problems with sweaty feet at the base, you may want to look into some of the others shown. There's no mesh lining at all, and may make you feel like you're wearing thick winter socks instead of ordinary boxing shoes. The Lace Ups are best for experienced boxers that need to fight or practice in a specific set of circumstances. 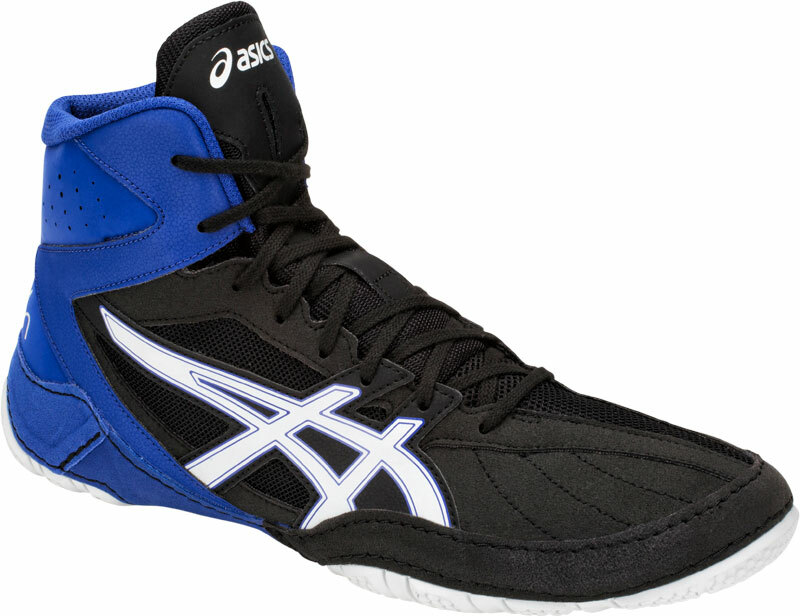 The Asics Cael V8.0 Wrestling shoe makes say it's for wrestling, but you should have no problem using it as boxing apparel. They will guard well against all moisture and give your feet good midsole support. It contains OrthoLite insoles, a brand that's known for comfort and the slow aging. But with these great features, the shoe may annoy you with how easily the color comes off and fade, especially when they are used on canvas. The Adidas HVC2 shoes are built for people that are practicing side movement or tend to move in from left to right very quickly. It's a low top but has a decent amount of support along the ankle, albeit thin. But with this, the product remains lightweight on the feet and doesn't give the "heavy" feeling when they're put on for a long time. Use them for a backup to another pair of boxing shoes that you already possess. The Nike KO is a midsole shoe that's made up mostly of foam material. The color is blue and will keep the wearer in control of their movements but not vulnerable to injury from dashing too quickly. It has a gum bottom that won't age very fast either, and shoe keeps them in good shape for a couple of months when higher than average use. One simple but sometimes disregarded rule in boxing is to protect yourself at all times. With the right footwear, you'll be better assisted to oblige this practice. Good boxing shoes will keep you focused on improving your technique. With this being said, use the following tips to find out which shoe in the reviews will help you amplify your style the most. Training Out or In the Ring? Talk to many professional boxers, and the first thing they will ask when giving advice for buying boxing shes is where they will be used. Every trainer shoe has pairs that are used exclusively for either training, ring practice, and actual fights. The reason for this is longevity. Training shoes will usually wear away much quicker, as they will be the product that's used the most. If you know the setting in which they will be used, then it will be much easier to pick. Additionally, some shoes are better equipped to handle the ring's canvas and/or concrete floors better. Just remember that you generally will have a better selection on recommended training footwear, since your movements on the gym floor could be minimal or stationary. Take a moment to properly measure your feet before you buy boxing shoes. Be sure not to forget about the width either. A boxing shoe's comfort may change depending on how narrow or wide the pair is. And for ring events, this can determine whether it will wreak havoc on your feet or not, in some cases. Boxing movements tend to be unpredictable, and moving from side to side will be particularly crucial to the space given in your sole. Granted, most boxing shoes aren't great for support, which is a necessary regression to maintain such foot control. As such, do not settle on a shoe that's too tight around the midsole. Some boxing shoes have tread, while others don't. And those with tread will generally be very thin and flexible. All of this is to help your freedom of movement since boxing shoes are more about agility than stabilization. Those that don't feature treads at the bottom will have a simple outer sole that makes that shoes resemble reinforced socks. These types are best for ring practice and official events but may not be well served in some training regiments. For example, if you're just sparring in a standing position that doesn't require any movement, then you might be better off with a boxing shoe that has more foot support. Those with straps are featured on beginner boxing gloves, or pairs made for sparring and other forms of training. Laces are what you’ll want for boxing (or training) that involves fighting in the ring. Additionally, you may want to get a pair that has more room for your palms to breathe if your hands sweat a lot during intense training sessions. Most of the gloves with laces won’t have this problem since the stitching will go up toward the upper palms. Boxing shoes are typically made of leather or synthetic materials. They are oftentimes mesh pattered and have thin support for ankle and midsole reinforcement. The inner materials could feature memory foam or polyurethane. At first glance, they almost resemble some running shoes. They may lack a tongue or shoelaces too, and the toe box will sometimes be narrow. Gum is also a popular material seen on those with treads. As for stiffness, the break-in on most is almost immediately due to the lack of support material through the shoes. It's recommended that you acquire a pair that will make your feet feel as light as possible, though there are some exceptions. Shoes that are good for boxing aren't always marketed as such. If you've already read the reviews above, you may have noticed that some of the brands are wrestling shoes. 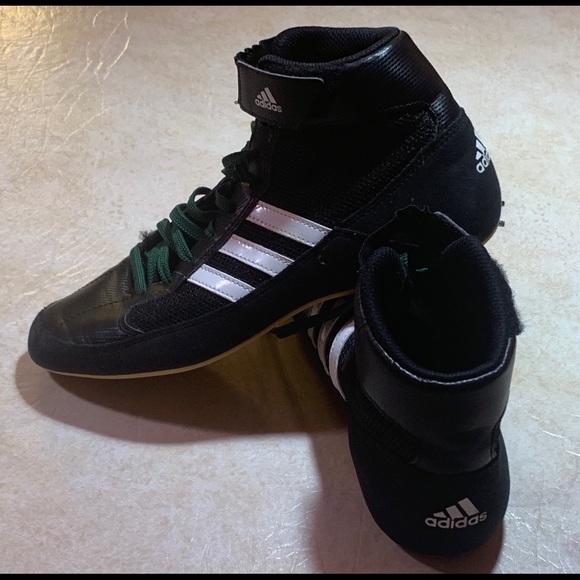 Wrestling shoes are great for practice, and will sometimes last longer than those build for canvas. You will have more ankle support and thicker tread as well but may find them a bit irritating if you're training incorporates some fast forms of movement. Jump rope is fine, but sparring with an opponent could lead to fatigue. Factor in your training routine and choose accordingly. High and low tops have their advantages and setbacks. 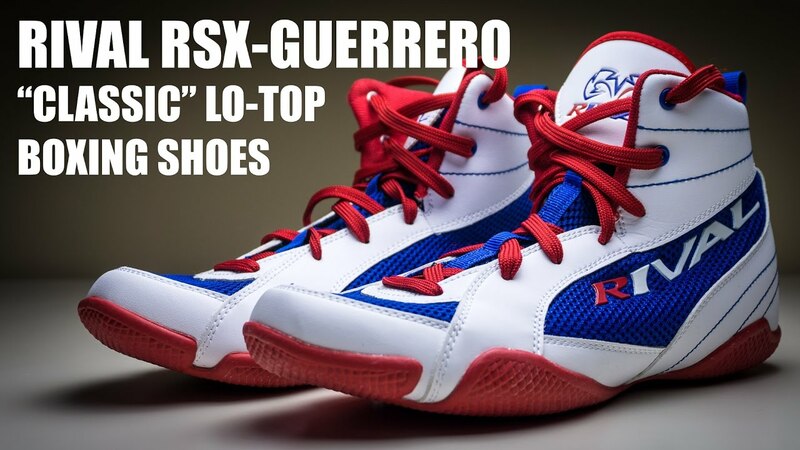 Low top boxing shoes, or those with a low height, have great for speed and breathing room. They can be put on a lot easier and can provide moderate support to the ankle. You won't get much in terms of reinforcement in the lower legs though. As for high tops, there's slightly more stability and the shoes may last longer without breaking. If your feet sweat a lot, you may want to stick with the low tops. 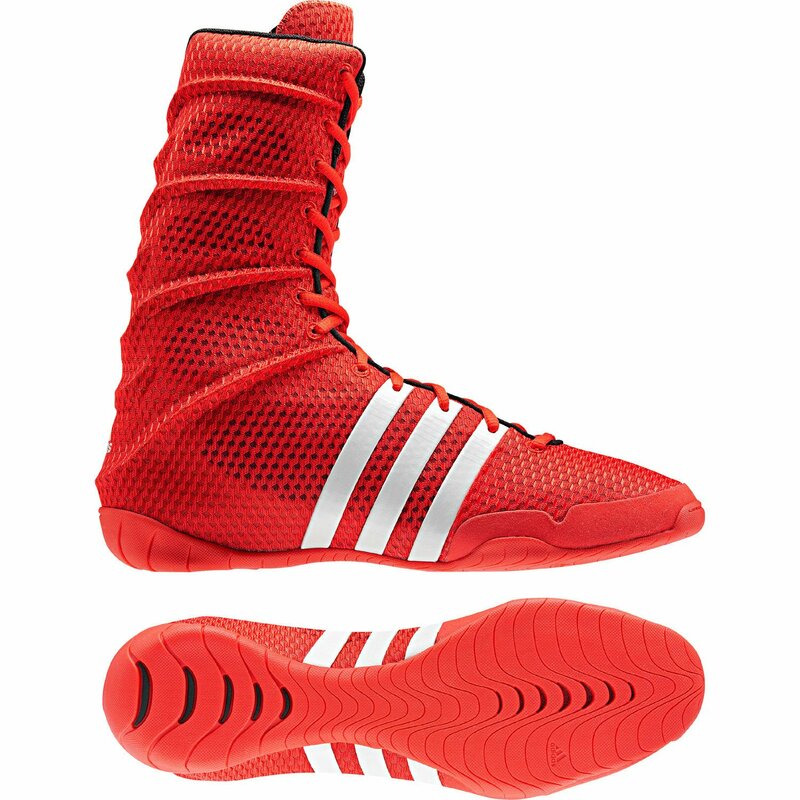 Use high top if you prefer them personally or need something that can be used at times when you must wear the same pair of shoes in the ring or on-the-ground practice. A typical boxer will go through several pairs of shoes in a relatively short amount of time. As mentioned earlier, this is part of the reason why you should separate training footwear from ring shoes. There's more freedom to try out shoes with better tread when you're not on a canvas floor, so look into those first if you're just getting into boxing, as most of your time will be spent outside of the ring. If you insist on going for longevity in ring shoes, look into those with at least some support around the base and ankle. In an intense workout session, you may find your shoes wearing away on the first day if you're too thin. Because of this, put durability over movement if you don't plan on going through more than three or more shoes in less than a year. Now that you're finished with the reviews and the Buyer's Guide, it's time to pick what's best. Ever boxing shoes reviewed has it's own individual qualities that set it apart from the rest. Still, the Adidas ADIPOWER and ASICS Cael V7 are without a doubt the best of the bunch when it comes to comfort on the ring. They are the shoes of champions, and also have a professional look and feel when worn. Regardless of this, the other eight shouldn't be disregarded, especially for those that need more than one shoe (a situation that's highly likely). So whichever boxing shoe you end up settling on, you're ensured to get a great piece of footwear that's built to make your movement quicker, jumps higher, and take our mind off the stresses of fatigue in the lower half of your body. Olexandr Mironov | March 25, 2019, 3:01 p.m.